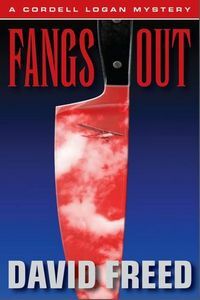 Fangs Out by David Freed: Synopsis and Online Purchase Options. Synopsis (from the publisher): Moments before he is executed, the killer of famed Vietnam War hero-pilot Hub Walker's daughter makes a startling allegation: the real murderer is Walker's close friend, a prominent U.S. defense contractor. Walker wants to hire somebody willing to spend a few days hunting up information that will refute the convicted killer's groundless but widely reported claims, and help restore his friend's good name. That somebody, as fate would have it, is sardonic civilian flight instructor, would-be Buddhist and retired military assassin Cordell Logan. A Medal of Honor recipient married to a former Playmate of the Year, Walker resides in the swanky San Diego enclave of La Jolla, overlooking the Pacific Ocean. Logan is convinced that working for Walker will be little more than a paid vacation — a chance to rub shoulders with a living legend while rekindling Logan's relationship with his own enticing ex-wife, Savannah. But after flying to San Diego in his beloved aging Cessna, the Ruptured Duck, Logan is quickly drawn into a vexing and deadly jigsaw puzzle. The deeper he digs, the murkier the truth appears, and the more in danger he finds himself. Who really killed the war hero's daughter, and why? Somebody in "America's Finest City" wants to stop Logan from asking questions, and will stop at nothing to silence him.